Basically there are no weather effects in play. The majority of the game takes place in clear weather, which is probably a good thing. Appears in Chapter 10 and Chapter 14. This has the general effect of reducing movement of all units, typically by 1 movement point per square. Besides flying units, movement isn’t reduced when traversing bridges, armouries, vendors and other small buldings. Curiously, interior terrains (such as Floor) do not reduce movement, while the Desert terrain actually becomes more easily traversable while it rains. There are no maps with rain that feature these terrains though. Lyn will warn you when the weather is about to change. Hannah will warn you when the weather is about to change. Appears in Chapters 9 (after a few turns), 13x, 18E/19H, 19xx, 20E/21H, 23H (Hard Mode only), 23E/24H (Lloyd) and 26E/28H. Fog of War limits the vision of playable characters to a radius of 3 squares. Thief-type characters have increased vision in Fog of War (with a radius of 8 squares), while you can also use the Torch staff or item to temporarily increase your vision. If a character moves into an unseen enemy unit, they will immediately stop in their tracks, so be careful when charging into unknown territory. Note that the decreased vision only occurs for your characters – enemy and NPC units seem to possess some form of night vision! Appears in Chapter 25E/27H (both versions). Barring its appearance, it functions identically to rain. 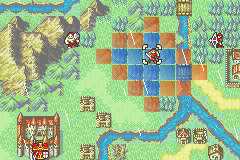 However, unlike the chapters that feature rain, you can shelter inside interior parts of the map where movement is not impeded. Until Turn 20, Nils will warn you when the weather is about to change. Until Turn 10, Nils will warn you when the weather is about to change.